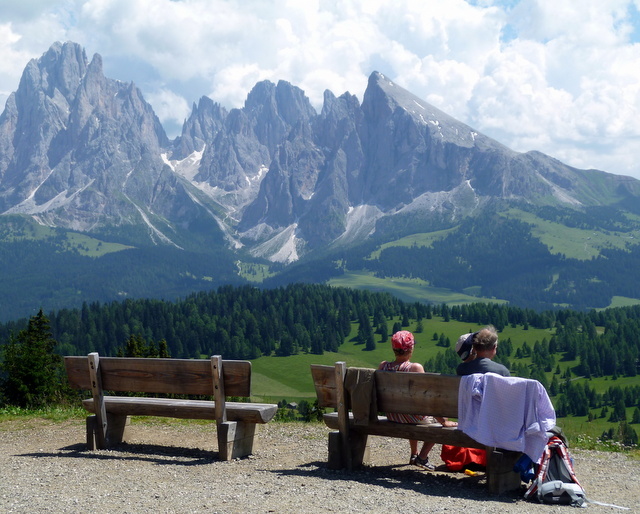 View across the Alpe di Siusi from the Mont Seuc lift area. This is the view that made me fall in love with the area. the going and doing. (Ric likes the going and doing. Lucky for me he plays along with my excessive need to plan.) We even enjoy getting a little lost as there is no better way to really experience a new place. But there is something about going back to a place we’ve been before that is also compelling. When you enter a town you’ve visited before, familiarity envelopes you like a hug from a friend. We found this to be so true in Oregon where we visited Cannon Beach twice each year. Knowing the restaurants and the best place for coffee and Danish at 7:00AM when you come off a beach walk at dawn; knowing how the tides affect the beach and when is the best time to explore the tide pools: These things made for a relaxing mini-vacation every time we went to CB. If you follow this blog you know we get out and see a lot of new places, but we also like the repeats. We hardly need a map in Venice after three trips there, but we always find new things to do there, like our Winter Break in Venice. 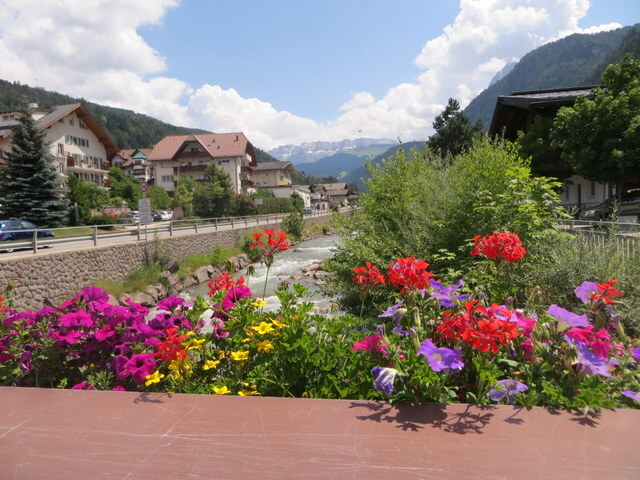 Colorful little Ortisei sits alongside a mountain stream. Leaving the Alpe di Siusi after two nights, we transferred to Ortisei. 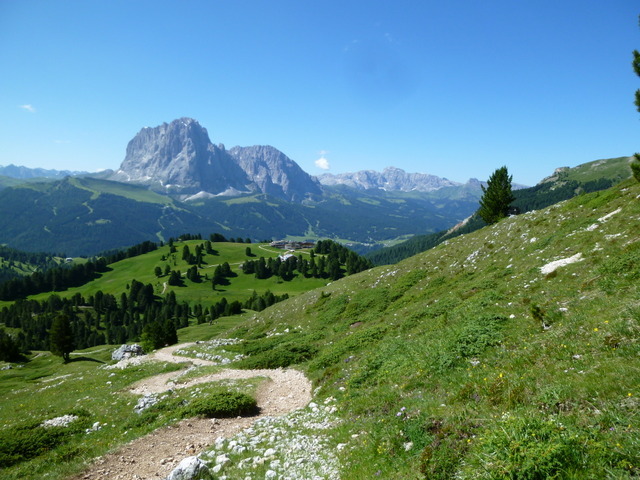 Although the two are but a few kilometers apart as the crow flies, it took us about three hours to make our way because the biggest part of the journey is descending from the Alpe di Siusi to the valley, about 600 meters, just about 2000 feet. There are no direct routes, especially without a car. From our hotel at Saltria we took a bus to the lift, made our way via the gondola lift down from Compatsch to Siusi, then another bus to Ortisei with some waiting required. In fact, last year we took a different gondola up to the Alpe from Ortisei and hiked to Saltria faster than we were able to go down via this year’s three-part public transportation journey necessitated by luggage. 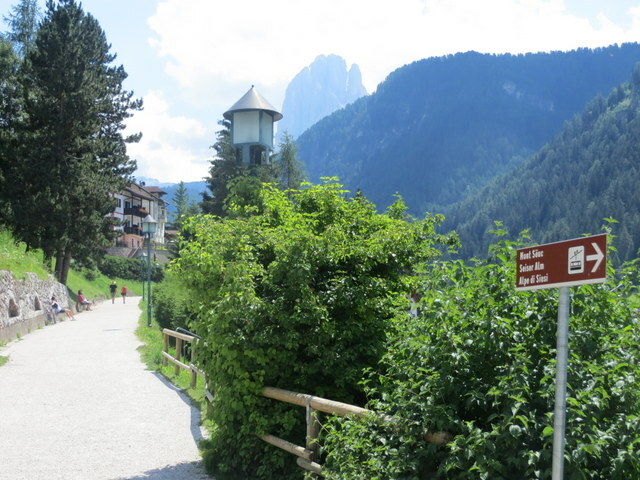 A walking path runs between the 3 villages of the Val Gardena. This time we knew where to get off the bus so we could enjoy the beautiful ride from Siusi to Ortisei. This time we knew exactly where to find our hotel, Hotel Garni Walter, up a steep street just across the river. No orientation, no navigation required. We were warmly greeted by Sylvia and Georg who remembered us from last year. 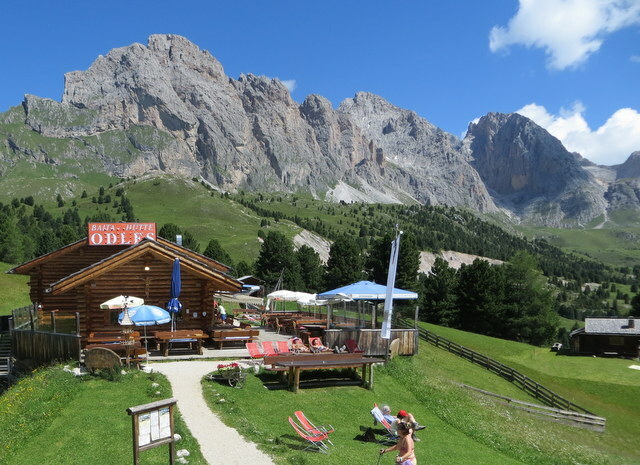 The familiarity with little Ortisei meant we could get to new adventures quickly: Three days of hiking high above the Val Gardena. 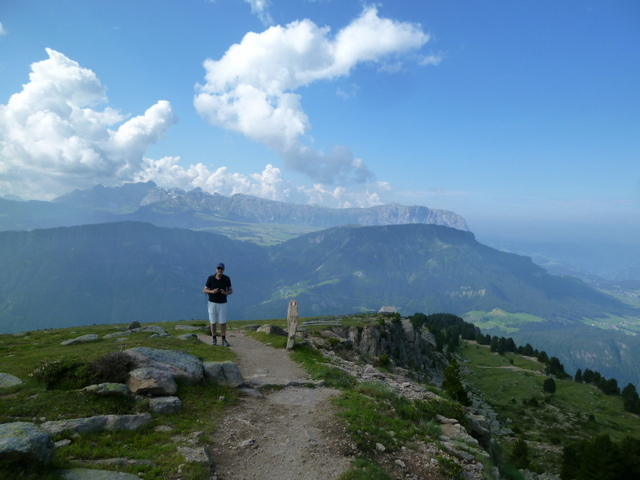 There is something for every ability level here: easy walks on wide paths, moderately challenging gains (and losses) in altitude, bike trails around jagged peaks, as well as technically challenging routes that require endurance and some mountaineering skills. 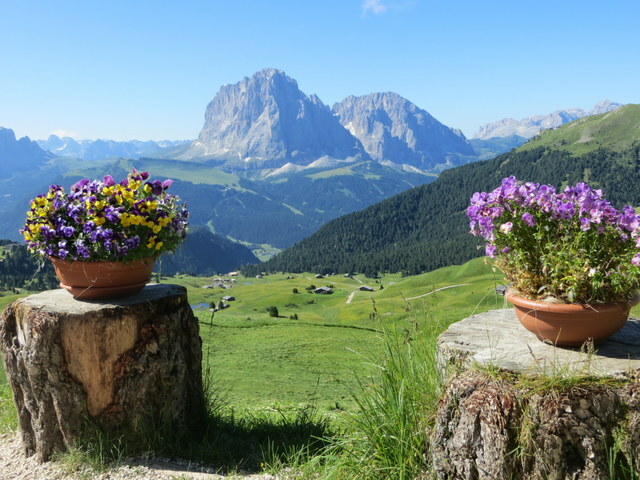 They are accessed by various lifts such as a funicular to Raciesa, a two-part gondola to Seceda, and various other lifts up-and-down the valley. Ric, high above the Val Gardena. 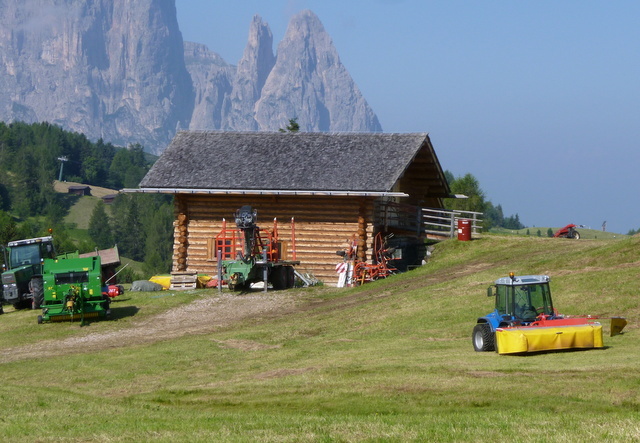 In the distance, across the valley, is the Alpe di Siusi, the meadow we hiked earlier in the week. the mountain. After a quick shot of espresso taken with a fabulous view, we set off toward Rifugio Raciesa and a loop hike, on a wide and well-groomed path. (For the record and those who want to go: trails 35 & 10.) After the rifugio the trail changed to a rocky climb, and looking back we started to see more people on the initial approach to the rifugio. We clamored up to Santa Croce and were rewarded with numbingly beautiful views, not too many people. But as we started back down, trail 35 started to look like an expressway at rush hour. 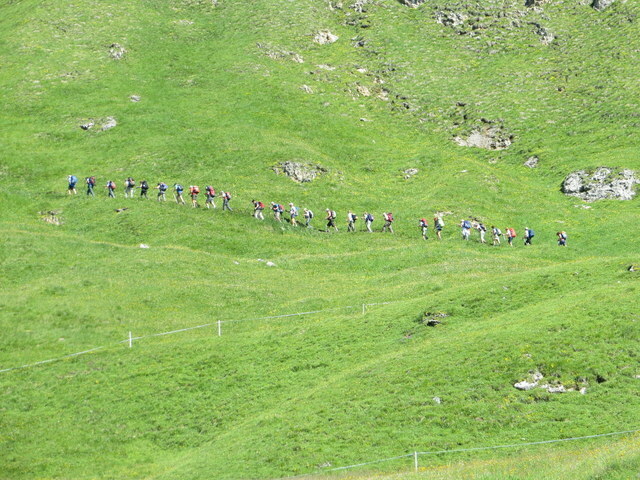 In pairs and groups, people were thronging to Rifugio Reciesa. Descending through high-alpine meadow, we congratulated ourselves on starting early, but fought our way back along the trail against the incoming swarm on the easy part of the trail. People with trekking equipment were outnumbered by grandparents and moms pushing strollers. 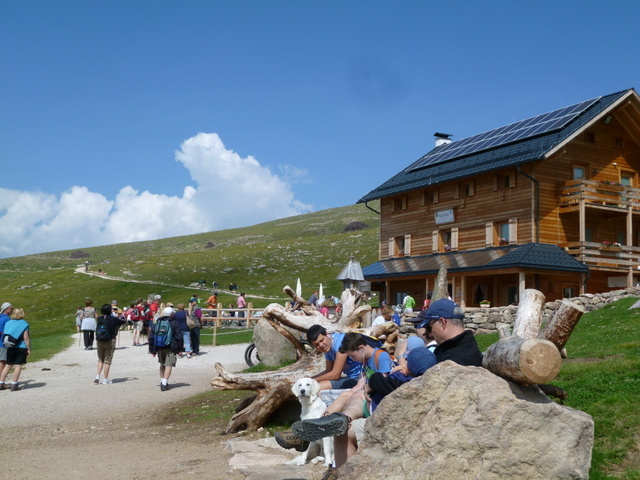 The hordes are easily escaped by taking a challenging route and there was a fine lunch to be had at a rifugio, served German-style with a nice cold Radler, a beer and lemonade concoction we have come to enjoy. By late morning, there was quite a crowd at this refugio. Past this point the trail got steeper and fewer marched on. 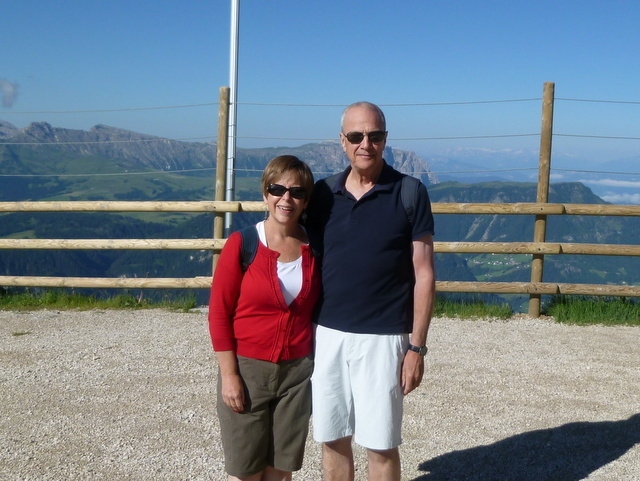 Another day we went to Seceda, one of the highest cableway terminations at 2518 meters (just under 8300 feet). A magnificent cloud free and chilly morning quickly warmed as the sun rose. This hike was challenging in that we encountered narrow trails, inset with concrete forms, meant to not only define the trail but to protect the meadow. A misstep would mean rolling down a steep meadow for 600-1000 feet. 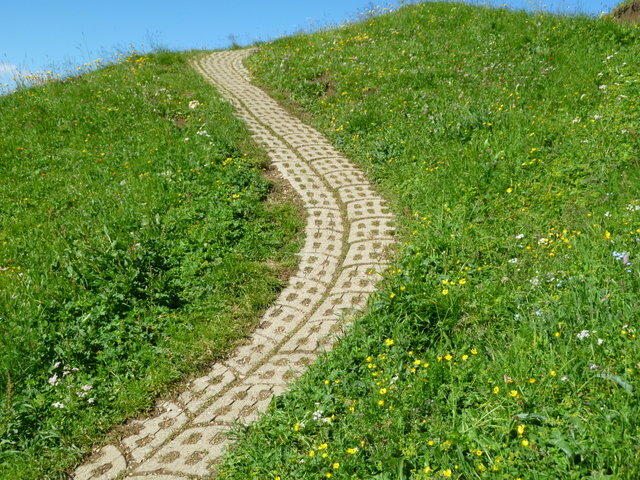 Other trails were rocky and slippery: not the super-highway of the prior day. (And no baby strollers!) Still the beauty was awe-inspiring as we made our way to Rifugio Firenze (trail 1) and on to the lift at Col Raiser (trail 4). Again herds of cows, tiny mountain barns, a distant church, and rifugi dotted the landscape backed by majestic rock formations and mountain peaks. Luckily we choose this direction as it was mostly downhill. Folks hiking toward us, having ascended at Col Raiser, were quite out-of-breath from the almost constant uphill trudge of 2 ½ hours. 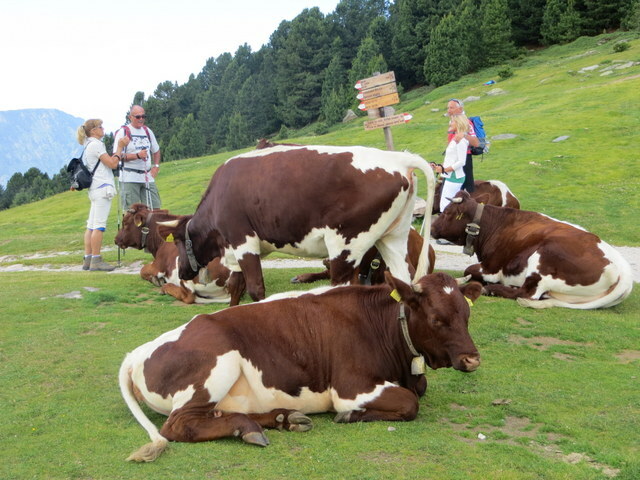 Lunch at Rifugio Odles (milk fresh daily from their own cows!) was restorative, including another lovely Radler. Site of another mountain lunch: tagliatelle with fresh mushrooms and a grilled vegetable platter. Try to find that on the trail in Oregon. Our final day we succumbed to the lure of the Alpe di Siusi again, taking a lift that is practically in the back yard of our hotel. We’ve had quite a work out for four days, so opted for a less-demanding route with slightly less elevation. As we encountered cows, horses, and a number of people making hay in the morning sun, Ric commented that we were, in actuality, hiking in farmland. However this “farmland” sits about a mile high, and is ringed with mountains, a far cry from the fields of North Dakota. where we had started 3 hours prior. From our hike through “farm country” we could see a rifugio far across the Alpe that we’d visited 4 days ago. This ability to see the landscape was almost as though we were looking at a map. And yet what seemed so vast was really a speck on the map of this great region, the Trento-Alto Adige, in this beautiful Italy. Laying right across the path, ambivalent to the parade of hikers passing by. From a tiny rifugio with goats and bunnies, we had a fine view down the meadow. As we hiked down the meadow, we saw this group hiking out above us. Glad we were going another direction! Luckily we walked down the mountain. Our ultimate destination is in sight at the end of the green area, a hotel on top of a cliff, but far below where we started the hike. We could see the starting point from the end, after 2+ hours of hiking. Across the delicate meadow “they” laid these concrete forms as a path, protecting the meadow from trampling and preserving the path. In some places the drop off below this “trail” was quite steep. One misstep and you’d roll for hundreds of feet. View from Seceda, about 8300 feet high. Thanks Hollie! It’s nice to know my ramblings are sometimes useful! The Alps are simply amazing. I can’t believe I’ve never been to the Dolomites. Stunning photos! Thanks Josh! Something to put on your bucket list! Just amazingly beautiful! I love that you can see where you’ve been and where you’re going at the same time. I just sounds and looks so much different than hiking around here. It was a true wonderment to us, too, Anita! We’d hiked for hours and then looked back and saw the starting point high above us in the distance. And then there are the refuges; beer, coffee and fine food along the way; bathrooms, not outhouses; passing through livestock, I’ll have to send you some pictures of the horses for your daughter to see!